We have taken a look before at some of the differences between Burli NE and Burli Newsroom when it comes to putting a script together and taking it to air, but that was really a look at some of the differences between the two. Today we’re going to examine scripts within Burli NE in more detail, pointing out the intricacies and tricks as we go. With that out of the way, let’s go cradle-to-grave with a script in Burli NE. The most basic way to get a story started is to go to your workspace and just get typing. Let’s start a story manually, without starting from an external source. First, head to your workspace. By default, when you first open Burli NE it’s the view in the bottom pane of the main window. If you’ve navigated away from it, just go into your Content Tree (on the left) and open Newsroom Data >> Personal Folders >> [Your Username]. 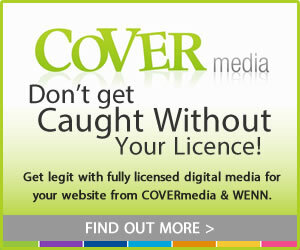 This is a networked folder dedicated to your use, and makes a great place to work on new stories. 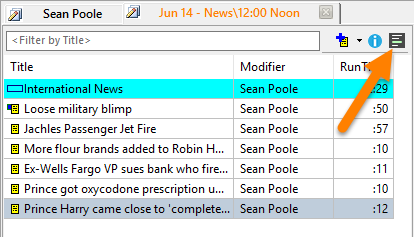 Once in your workspace, either drag in an existing story (from a newswire or other folder in the top pane) or simply hit the New Story button. You get a new story editor window where you can get to work. Associating some form of media with a story is very common. 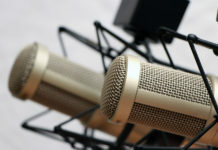 To include audio, just drag and drop the audio into the story. Drop it right into the text, exactly where you’d like to have it play for your on-air reading. A green audio link appears to indicate where your sound will be played. It can be moved within the story, and can be anywhere from the very start to the very end. Burli NE also supports other kinds of media as well. You can include video for playback in the same way, or work with lower thirds. You can also include supplemental information via text that will not appear in the Prompter. To do this, add a Note. Right-click any tab over your story, and select New >> Note. A new blue Note tab will appear to the right of the tab you right-clicked. Anything entered in a blue Note will not appear in the Prompter. This is a great way to have related information travel with the story within the Burli system, without having it confuse an on-air reader. 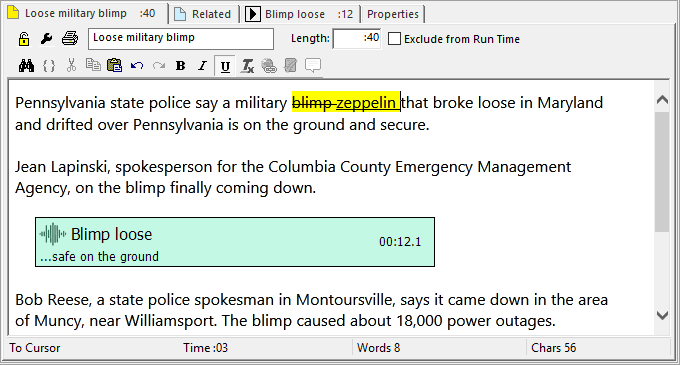 Speaking of readers, did you know Burli tracks the run time of everything in a script – including the individual text stories? We set a default rate of 175 words per minute, but some people speak more quickly, and others more slowly. When building a script for on-air use, it can be a good idea to set a WPM rate appropriate to your reader to keep your newscast on time. 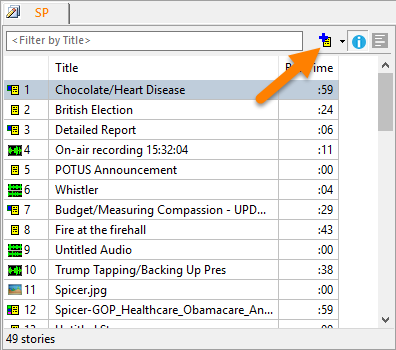 To do that, simply select the story in the Story List in your work folder, go to the Reader column, and select one from the pull down menu (or click on <More…> to see the entire available list in your newsroom). Now you’ll have a greater certainty that your newscast will run to time. Getting a story approved in Burli NE is easy. 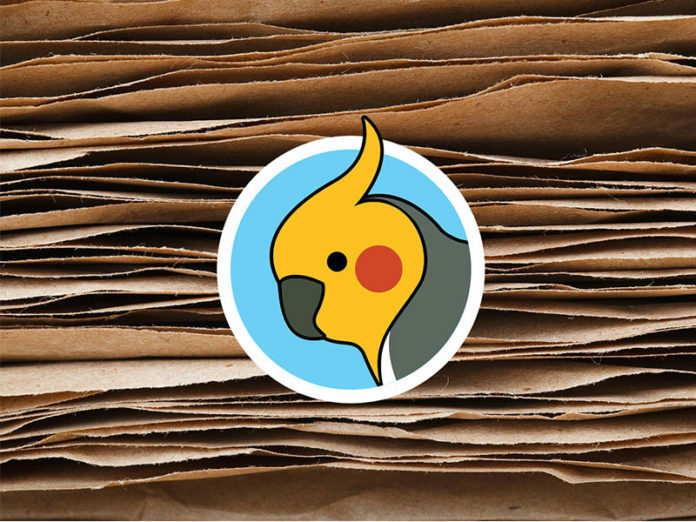 An Editor with access to your folder (or whatever folder your newsroom has set up to submit stories to) can go to a story and change its value from Unedited to whatever state he or she likes. These Editorial Approval States are completely configurable. They can be named by reviewer, by process name, by number, whatever you like. And they can be colour coded for easy identification of stories that are Approved – or ones that still need a little polish! Speaking of which, if your story isn’t quite ready for prime time, your editor may make a Suggestion. 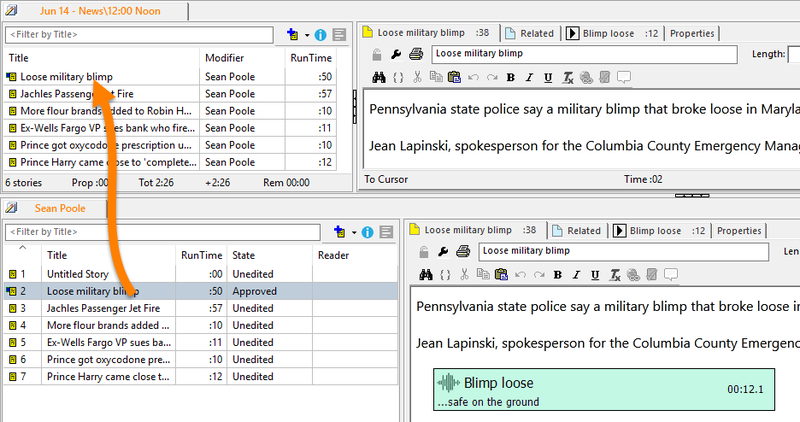 These tags show editorial comments, and even allow for suggested text substitutions, streamlining the editing process. Once you and your editor are happy with your content and all your stories are ready, the good news is that building a script is easy and fast. 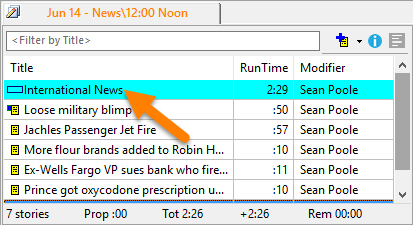 Either open a template script (with your station’s default sounders, sections, timing, etc) or right-click anywhere in the Scripts folder and select New >> Rundown. Either way, you can begin dragging and dropping your stories into the script. They will appear in the finished script in the order they are listed. Break your stories up by category (and introduce useful section timing) by adding Section Breaks. Hit the pull-down arrow next to the New Story button and select Section Break. 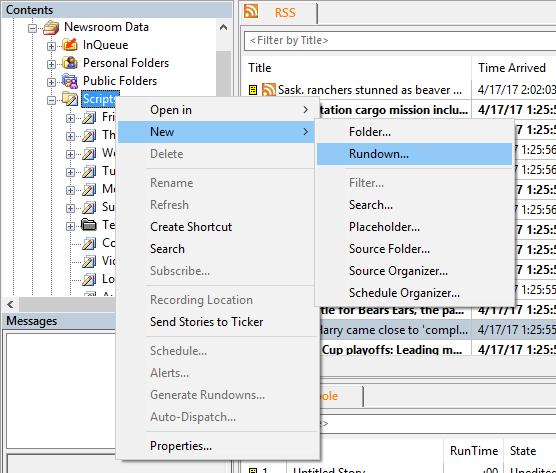 Once inserted, the Section Break can be renamed anything you like, and will add up the running time of all items below it, until the next Section Break. …and the sum of your efforts is displayed, ready to read! Your brand new script, on display in the Prompter! There’s a few more steps than the minimum required listed above, but you can see putting a script together in Burli NE is fast and easy. And that’s just the tip of the iceberg – stay tuned for even more great features from Burli.